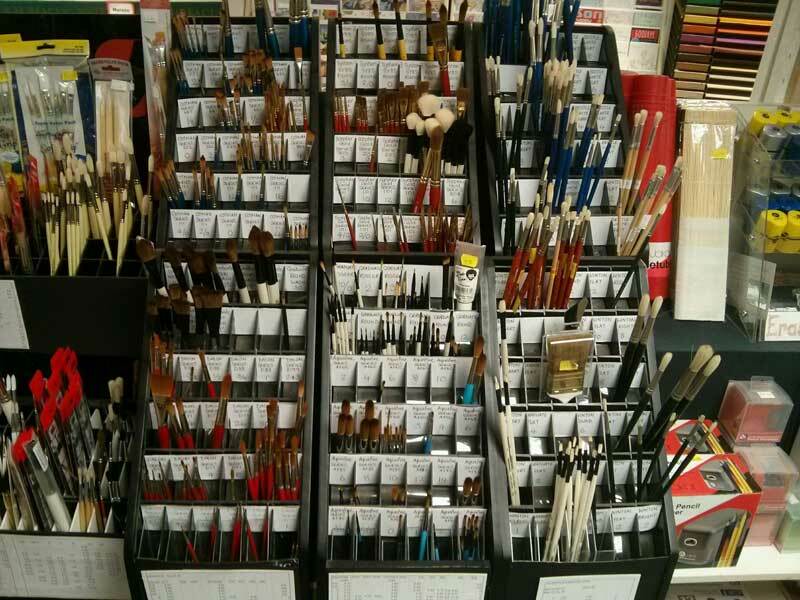 Two of the most common questions asked by aspiring artists in our Leicester shop are why do paint prices vary so much and what is the difference between each type of brush. Paint is a very interesting topic of discussion as colours and quality vary so much. The quality of paint will fall into two basic categories, artist and student. Famous brands such as Winsor & Newton, and Daler Rowney maintain their artist quality colours contain pure pigments but their student colours are chemical based. For this reason the artist colours are more vibrant and their longevity is much better. When producing paint some colours are very easy to make and can almost be mass produced where as colours such as the artist quality cadmium ranges have to be produced very slowly and the high pigments are becoming rare. Pigments have to be broken down between rollers which is a slow process as the pressure and speed of the rollers has to vary depending on the colour. Each colour will have the same quality of pigment with a different medium depending if you are making oil, water colour, or acrylic colours. Student quality colours from these two famous brands are still of excellent quality but do not have the vibrancy of their artist quality partners. Student paint can be made in large quantities at speed which helps to keep the cost down. There is a huge variety of brushes available from many types of retail outlets and on the internet coming from all corners of the world. Buying a brush should be a tactile experience as the length and stiffness of its bristles is important, as is the point its bristles will come to. In general terms water colour brushes are softer hairs with a good quality sable having a” belly” in the centre of it’s hairs which will hold a quantity of paint which can be used to cover larger areas. Most synthetic brushes do not have this “belly” so the quantity of colour it can hold is limited. Oil and acrylic brushes tend to have stiffer bristles as painting onto canvas and boards can be very abrasive. Synthetic and natural brushes can vary greatly in price depending on the quality of the bristles used and their country of origin. For information on individual types of brushes or brands we suggest that customers consult with their local retailer or look on the internet.